Note: The NKT22FF is now longer available. Please see the NKU32FF here. The NuKeeper Twin “NKT” models provide a range of professional designs all based on our Hi-mobility AT chassis, incorporating heavy duty 200mm soft ride castors and all round bump protection. There is a choice of two styles, either our classic Flexi Front model with hideaway front covers or our Hard Front cabinet design. Both designs are available in 3 models to provide for added laundry bag facilities or the incorporation of added operating features to meet system requirements. 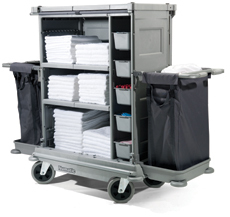 The NKT22FF includes a full twin capacity hideaway front cover system, hi-mobility soft ride chassis, 5 internal storage drawers and 2 x 100-litre laundry bag extensions.